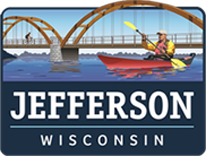 The City of Jefferson combines the ease of urban living with the beauty and freshness of a rural environment, complementing the alliance is the convenient proximity to Wisconsin’s two largest metropolitan areas. As the county seat of Jefferson County, the community of Jefferson is 35 miles west of Milwaukee and 25 miles east of Madison. The City of Jefferson is a quick 4 miles south of Interstate Highway 94 linking those 2 cities. Driving distance to I-90, leading directly to Chicago, is less than 25 miles. A full range of City and County services are available to the citizens of Jefferson. A Mayoral/Aldermanic from of government serves the public in cooperation with city officials and various committees, commissions and boards that specialize in the necessary areas of city government, such as education, solid waste, public works, finance and business, parks and recreation, EMS, police, fire, library, community development, and many others. Jefferson is the site of Jefferson County Courthouse and Law Enforcement Center, Jefferson Countryside Home nursing facility, and Workforce Development Center offices. The newly updated Jefferson County Fair Park offers many new buildings and a 2,000 seat grandstand. Jefferson educators are justifiably proud of our outstanding school system. While meeting high academic standards, both public and parochial education is geared to the total needs of the child. Athletics, as well as other extracurricular activities for both boys and girls, are included as an essential part of their complete educational program. The educational needs of post-high school students are met by the Fort Atkinson branch of Madison Area Technical College and the University of Wisconsin campuses in Madison and Whitewater–all conveniently located within easy driving distance. Jefferson is also home for the well-known St. Coletta School, where the sisters of St. Francis of Assisi gave specialized care and education to the children and young adults with learning disabilities from across the United States and Canada.